Mom was born on February 11, 1913. I don’t have her birth certificate but on my birth certificate it says she was born in Omaha Nebraska. I have absolutely no pictures of her as a baby or even a really young girl, but I have lots of pictures of her as a teenage and young woman and wife and mother. This is perhaps the oldest picture of her that I have. She’s the big girl sitting in the front. The big boy in the back is actually the father of all these kids. That’s Roy Shively Sr. from what I understand. 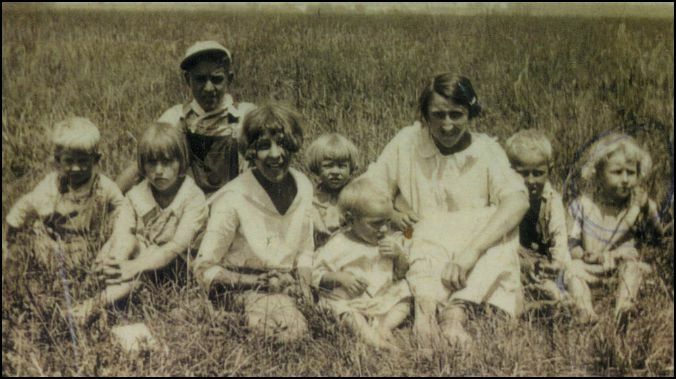 I do have another picture of the family when they were pretty young also. Mom, Katie, is the one in the dark dress. Of course that’s Roy, her adoptive father and Teresa , her mother, holding the baby. I expect she spent most of her life holding a baby. Mom was born two years before Roy Shively married Teresa Milner. She did not know that and didn’t think about growing up. I believe she found out in 1968 when Teresa Shively passed away. From what I understand she learned about it on her mother’s death bed. It came as a real shock to her and I remember her sitting at the kitchen table on 60th & Pratt Street crying about it. It was really sad. She helped raise her brothers and sisters and quit school to go to work for the Telephone Company and help support the family. Roy seemed to love Kate as much as the rest of the kids. Many of the others commented that they always thought that Katie was his favorite. I heard that on several ocassions. Mom was tall and thin in her young adult years. Her brothers and sisters always thought she was a beautiful woman. It’s a little difficult for a son to evaluate his mother’s beauty. We just don’t look at our mother’s that way. But according to all the pictures she left behind in her scrap book she had a lot of boyfriends, or at least she had a lot of male acquaintences because she had literally dozens of pictures of herself with guys. One of her old boyfrieds shows up a lot in her scrap book and it looks like it’s over a period of about 7 to 10 years. She’s very young in some of the pictures with him and they both look a lot older in some other pictures. I guess that’s entirely possible because s he didn’t get married until she was nearly 29 years of age from what I can figure out. She was born in February of 1913 and she was married in November of 1941. There were lots of years before then to have boyfriends. His name was Cecil. 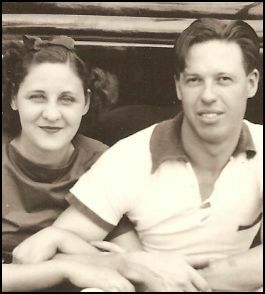 Mom and Dad got married on November 4, 1941 but when Japan Bombed Pearl Harbor, Dad reinlisted in the Army and was gone for the duration of the war. 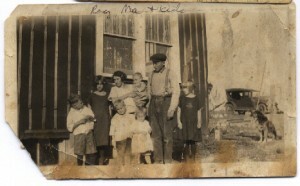 Mom stayed with her parents on the old homestead on the southeast corner of 42nd and Laurel. 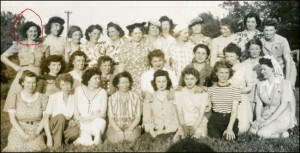 She continued to work for the telephone company and helped support the family. She was an actual hands on operater for the Kenwood exchange which was housed somewhere around 30th and ames. It seemed like the ladies of the phone company took care of each other during the war especially. Mom was really into the movies and the movie stars. Several times in her life when she would visit relatives in Southern California, she would always go to Hollywood and tour the studios. Under my home movies for the 1930’s you’ll find a few clips from her visit in 1936 with her friend Genevieve. In the movies you see several of the major movie studies and a couple people that I think were supposed to be movie stars, but I’m not sure who they were. 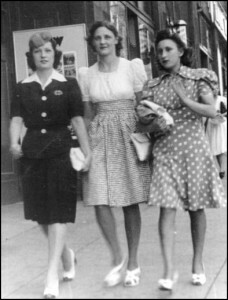 Here to the right is a picture of Genevieve on the left, Kate in the middle and dorothy (shively – workman) on the right as they walk down Hollywood blvd. 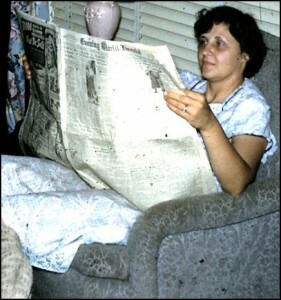 Mom struggled with cancer in her later years. It began with breast cancer and in the 70’s she had a radical mastectomy and lived another decade. It returned in her bone marrow and she passed away on November 22, 1985. Her and Rita were pretty close and Rita took care of all the details of Mom’s funeral. We came from Dallas, of course, and it was held at Holy Name. It was sad because I knew very few people who came to her funeral. She had lots of friends, but I was not close with any of them and didn’t know any of them.